Valley Gem heads down the Muskingum River to its confluence with the Ohio River. Nothing excited Samuel Clemens more than his time on the riverboats. 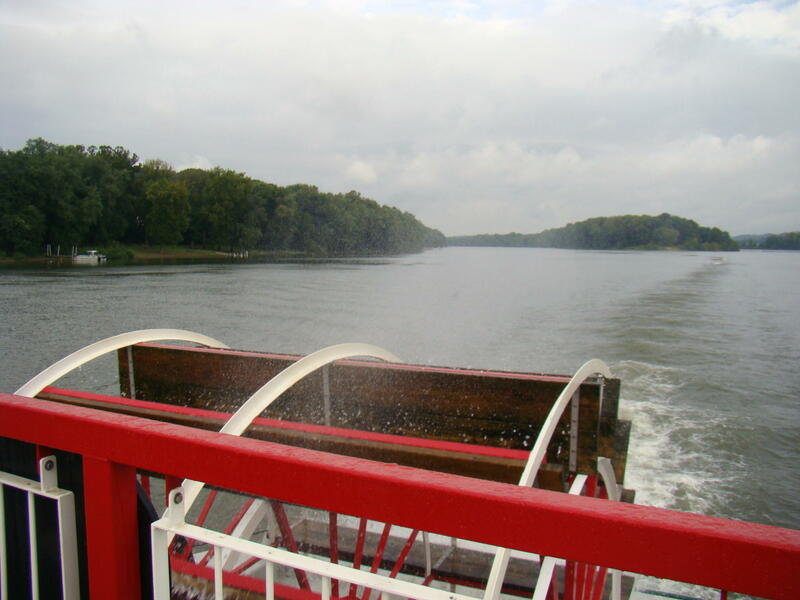 The sound of the paddlewheel hitting the water thrilled him, while the changing landscape gave him opportunity to see deer and even Injuns, while sitting in the pilot house. Some say Clemens received his pen name, Mark Twain, from this passion for the river, since Mark Twain means “mark number two”. The second mark on the water measuring stick signified twelve feet of water – a safe depth for boats to pass easily. 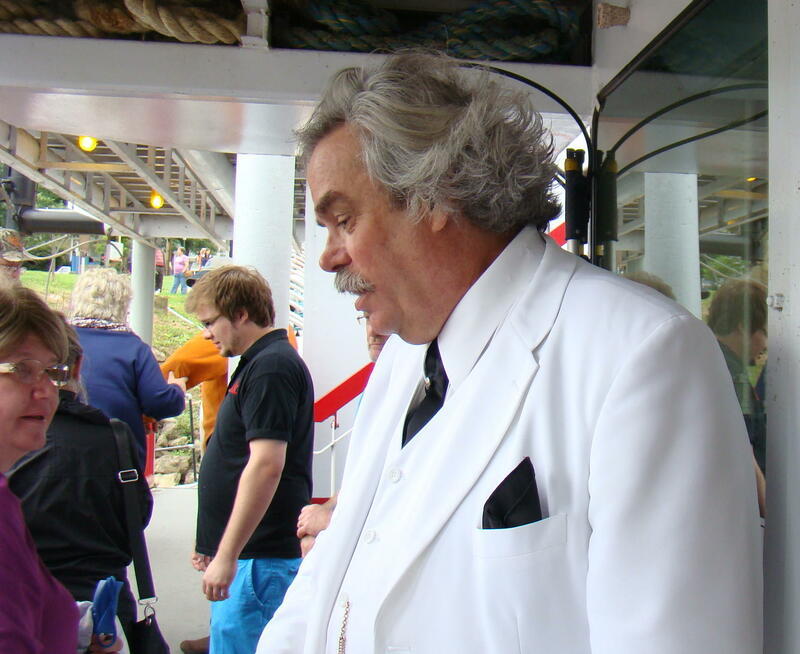 Spending time on the Valley Gem, with the charming impersonator of Mark Twain, delighted all passengers. 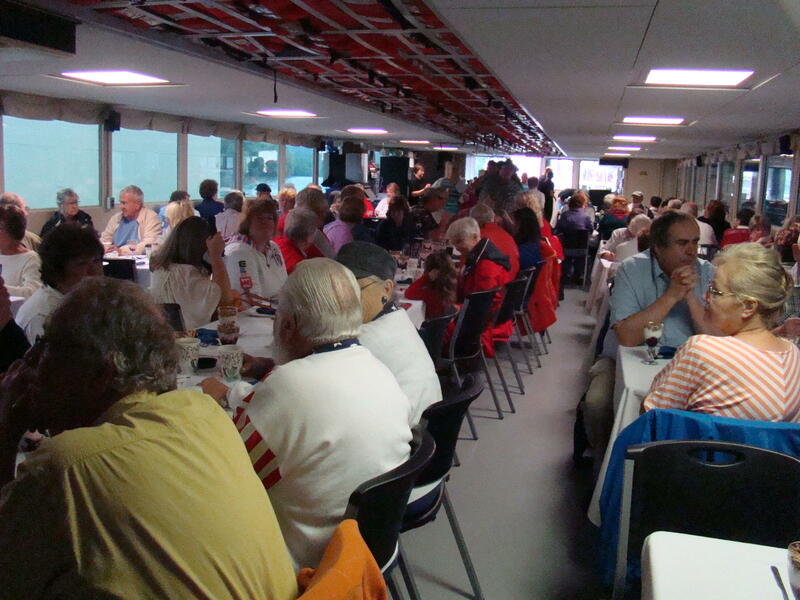 They also enjoyed a tasty breakfast buffet as they cruised the Muskingum and Ohio Rivers. 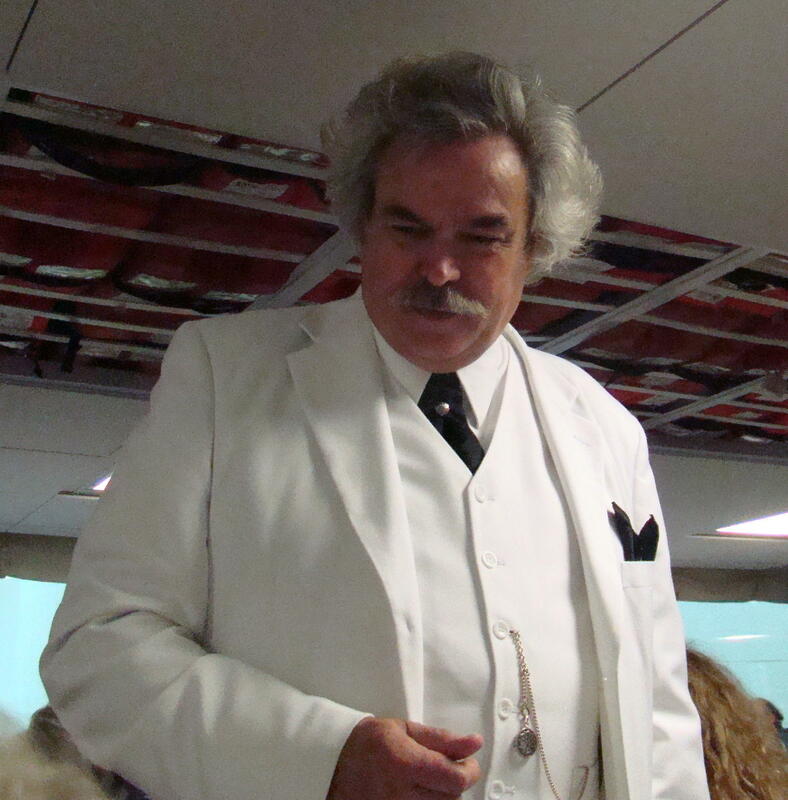 Mark Twain, portrayed by Stephen Hollen, greeted everyone with a hearty welcome as they stepped aboard the Valley Gem at Marietta, Ohio. Immediately his sense of humor became apparent as he strolled from table to table encouaging everyone to try the marinated road possum and grits. His enjoyment in that role quickly ignited the crowd into a happy mood. 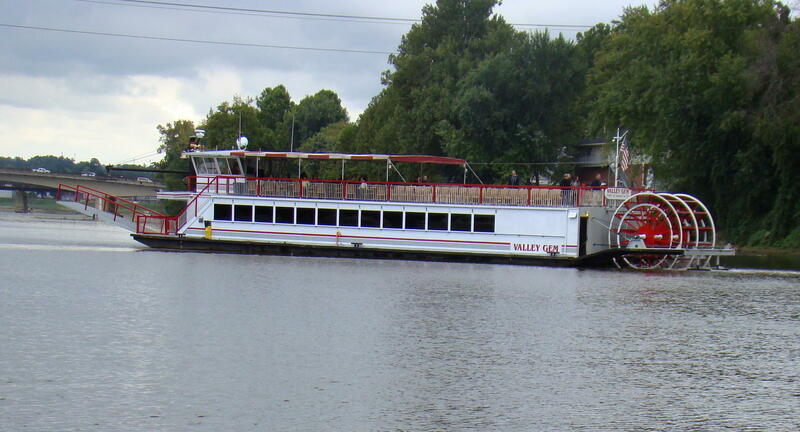 The cruise was a smooth two hour ride up and down the river. Many enjoyed going to the top deck to get a better view and feel the breeze. The paddle wheel created quite a spray so those standing near it received a generous sprinkling. After some fresh air, passengers returned to the main cabin to listen to Mark Twain spin his yarns. Twain then told of his being born in 1835 at Florida, Missouri – population 99. Growing up, he was given a big spoon of cod liver oil every day. He remarked that his tongue and body were so slippery, he could have eaten broken glass and it would have passed. At 13, Samuel Clemens became a printer’s apprentice and soon joined his brother Orion’s newspaper, where he discovered he enjoyed writing stories. A few years later he headed to St. Louis, Missouri for another newspaper job but got sidetracked by falling in love …with the river. After becoming a full-fledged riverboat pilot, he was paid $250 a month. The only other people in the United States at that time that made $250 a month, besides river pilots, were the vice-president of the United States and Chief Justice of the Supreme Court. Riverboat pilot was much more profitable than writing fiction! When riverboat travel became impossible in 1861 due to the Civil War, Mark Twain returned to the world of the newspaper. His adventures led him across the United States from coast to coast as well as to Europe and the Middle East. After his travels, he settled in Hartford, Conneticut with his wife and family in 1873. That is where he wrote stories based on his memories of growing up in Hannibal, and enjoying the Mississippi River. Tom Sawyer and Huckleberry Finn came to life through his pen. Mark Twain says thanks to each passenger as they leave. Down the river, Down the river, Oh down the O-hi-o. I’ll not tell the story though, perhaps the next time he visits Marietta you will get a chance to hear more of his delightful tales. Later in life Mark Twain uttered this comment: “I came in with Halley’s Comet in 1835. It is coming again next year, and I expect to go out with it. It will be the greatest disappointment of my life if I don’t go out with Halley’s Comet. The Almighty has said, no doubt: ‘Now here are these two unaccountable freaks; they came in together, they must go out together.’ ” And Mark Twain was not disappointed. The Valley Gem is located next door to the Ohio River Museum at 601 Front Street, Marietta, Ohio, one block from Ohio State Route 7, and minutes from I-77.